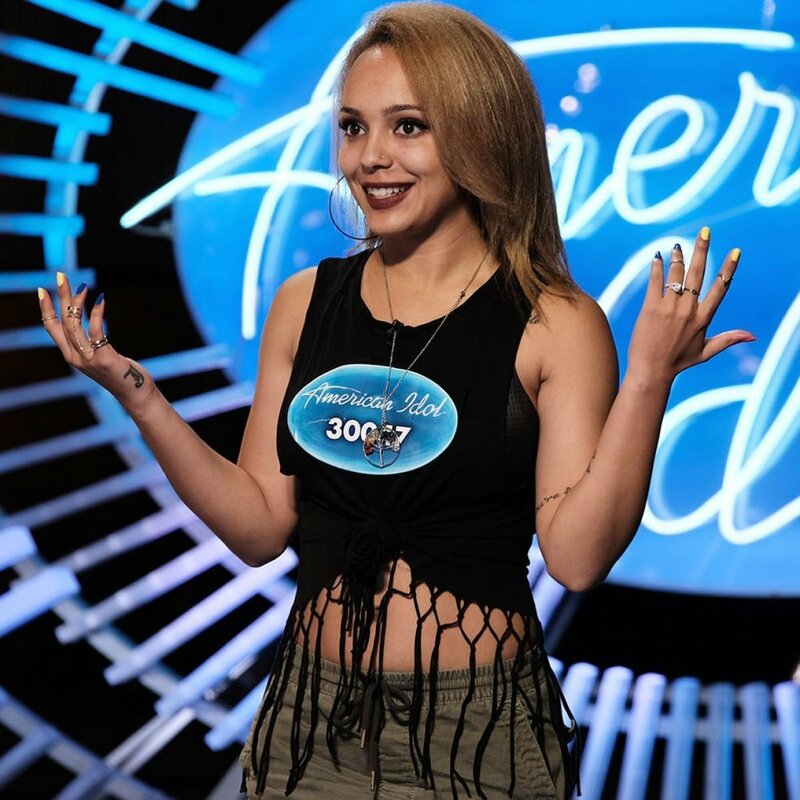 'American Idol' auditions wrap with last group of hopefuls going to Hollywood -- including Drake Milligan, Carly Moffa, and Jurnee! American Idol's Season 16 auditions have come to a close, with the judges advancing their final group of hopefuls to Hollywood during Sunday night's two-hour broadcast on ABC. Following weeks of exciting, impressive and strange auditions, Katy Perry, Lionel Richie and Luke Bryan narrowed down the field to 169 aspiring singers, who all received golden tickets and made it to Hollywood Week. Last night, several artists had stand-out auditions and will probably be ones to watch in the next Hollywood round: Drake Milligan, Carly Moffa, and Jurnee. Drake, a 19-year-old actor and Elvis impersonator from Fort Worth, TX, sang "You Look So Good In Love" by George Strait. Luke was all "fired up" over Drake's performance, which he called "cowboy cool." Luke thought the singer "crushed" his performance, and Lionel pointed out that Drake is comfortable in his own skin and in his voice. After Lionel said Drake is "the whole package," Katy noted he's "a star in the making." Drake therefore received three yeses to go to Hollywood. Carly, a 25-year-old musician from Williamstown, NJ, performed an original song with lyrics about letting a lion out. Lionel was impressed by Carly's vocal quality and personality, and Luke thought her voice had "a lot of character." Luke thought the singer was "quirky" and "tremendous," and Katy admitted her artistic sound works for her -- when it typically doesn't work for other artists. Carly received a golden ticket with three yeses because of her "full, beautiful, folky" voice. Jurnee Weathers, an 18-year-old hostess from Denver, CO, sang "Rise Up" by Andra Day. Katy said Jurnee sings "like a little bird," so effortlessly, and she's "wildly talented" and "has arrived." Lionel was taken aback by her vocal command and amazed by her runs. After Luke just kept repeating "yes," Jurnee earned three yeses for Hollywood. Lee Yasi, a 20-year-old retail associate from Fayetteville, NC, had an excellent audition with Toni Braxton's "Love Shoulda Brought You Home." The performance started out incredibly but got a little pitchy over time due to Lee's nerves. While the judges agreed Lee has some things to learn and could be polished, they agreed she has the potential to make the Top 10 and is the whole package. Gabby Barrett, a 17-year-old high school student from Pittsburgh, PA, sang "Good Girl" by Carrie Underwood. Luke thought Gabby sounded like a strange combination of Carrie and Nicki Minaj, but Katy pointed out she had heard a mix of Carrie and Demi Lovato in her voice. While Gabby took the judges' comments as a compliment, the panel thought her performance was a little gimmicky. Gabby didn't have a country voice, so she decided to belt out a church song for the judges in attempt to show whom she'd be as an artist on American Idol. The second song won the judges over, as they said she's "on fire," and so she advanced to Hollywood with three yeses. Caitlin Lucia, a 22-year-old waitress from Orange County, CA, performed "I Kissed a Girl" by Katy Perry herself. If someone sings one of Katy's songs, she wants the person to sound equal to her voice or better. And in Caitlin's case, Katy said she put a "cool twist" on the song. The judges knew she had more to show -- including her amazing vibrato and falsetto -- so Caitlin earned her golden ticket. Adam Sanders, a 24-year-old entertainer and drag queen from San Antonio, TX -- who now goes by the name, Ada Vox -- previously auditioned for American Idol back in Season 12. Adam, who auditioned as a man at the time, made it to the Top 50, but he had yet to get in touch with his real self. Ada Vox sang "House of the Rising Sun" by The Animals, and the judges had a clear understanding of who she is. Because of her amazing level of talent, the judges gave her a golden ticket but advised her to "get serious" about the competition. Another Hollywood contender is Samuel Swanson, a 28-year-old personal assistant from Pine Level, AL, who performed "You Make Me Feel So Brand New." Luke couldn't image how great Samuel will be once his nerves go away, as his voice was like "silky velvet." Katy thought Samuel needed to relax and do some breath work, but Lionel acknowledged his singing was "effortless" at his core. With three yeses, Samuel advanced to Hollywood. Brielle Rathbun, an 18-year-old choreographer Johnson City, TN, performed "Gravity" by Sara Bareilles. Lionel was smiling the whole time because she had complete control over who she is and her voice and body language. Katy loved the sound of her smokey and raspy tone, but she also pointed out there was power behind her unique voice. Luke found Brielle to be a natural, and so she received three yeses for Hollywood. Michael J Woodard, a 20-year-old bowling alley attendant from Philadelphia, PA, sang "Make It Rain" by Ed Sheeran. Lionel called him "refreshing" and Katy thought his "bright-eyed and bushy-tail" personality was sweet and beautiful. Luke predicted America is going to pull for Michael in this competition, and with that being said, the artist earned himself a golden ticket. Mylon Shamble, a 24-year-old barbershop bartender from Bradenton, FL, also made it to Hollywood Week with her performance of "Stand By Me." The judges gave her a unanimous "yes" because they saw and heard something special in her. Hollywood Week begins on the March 26 episode of American Idol, airing at 8PM ET/PT on ABC. 'Dancing with the Stars' couple Emma Slater and Sasha Farber get married! Jeff Schroeder and Jordan Lloyd from 'Big Brother' and 'The Amazing Race' expecting Baby No. 2!